Following the release of her Glamour cover, Anne Hathaway made an appearance on the Today Show yesterday morning(May 31st) in New York to continue promoting Ocean's 8. Before she stepped out, she posted her look to her instagram page. 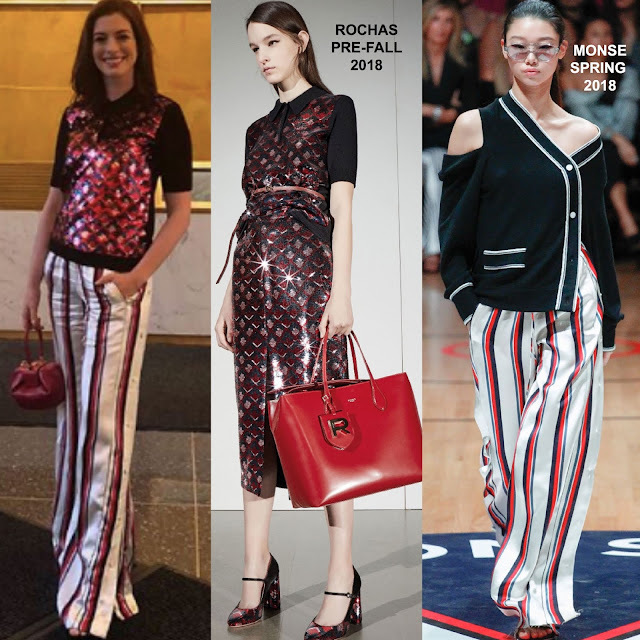 She posed for the gram rocking an ROCHAS PRE-FALL 2018 sequin panel short sleeve knit top and MONSE SPRING 2018 wide-leg stripe trousers. While the creases are unfortunate, I do like the styling of this look. I have never liked Anne's style more than I do now and that's thanks again to Law Roach. He styles her in so much fun and bold pieces. A GABRIELA HEARST bag, NICHOLAS KIRKWOOD sandals and a colored lip finished up her look. Are you feeling Anne's instagram style?